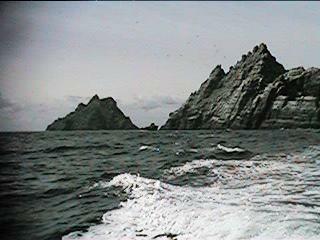 Skellig Michael is an island off the coast of Ballinskelligs in the county of Kerry. Access to the island is not easy. It involves a 50 minute sea journey and the climbing of 640 steps to the top of the island. It is well worth the effort as the settlement is in excellent condition. The monastery was founded around the 7th or 8th century. We know very little about the community or the names of the abbots. 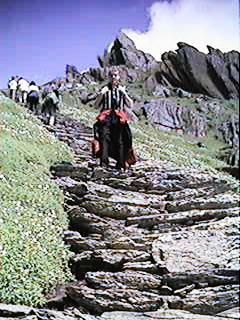 There is a reference in the monastery at Tallaght to an abbot named Sweeney of Skellig Michael visiting Tallaght. We also know that in 823 A.D. the vikings raided the island and kidnapped the abbot. We also know that the monastery ceased around the tenth century due to climatic changes which made the sea journey even more difficult if not impossible. What is clear is that these monks lived in peaceful harmony, a brotherhood devoted to contemplation and prayer. 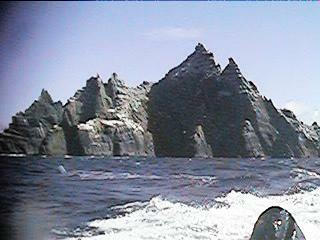 There are two islands; one is a bird sanctuary and the other is where the monastery is located. 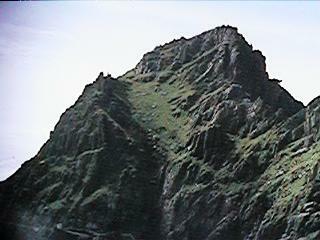 The monastery is located at the top of the photo on the left. 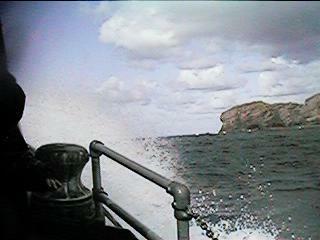 Getting to the island involves a fifty minute sea journey which can be very difficult. The boat will not travel when the seas are really rough. 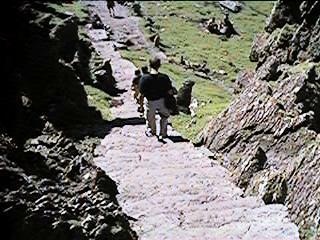 Climbing to the top involves walking up 640 very steep steps. The monks must have been very fit people.